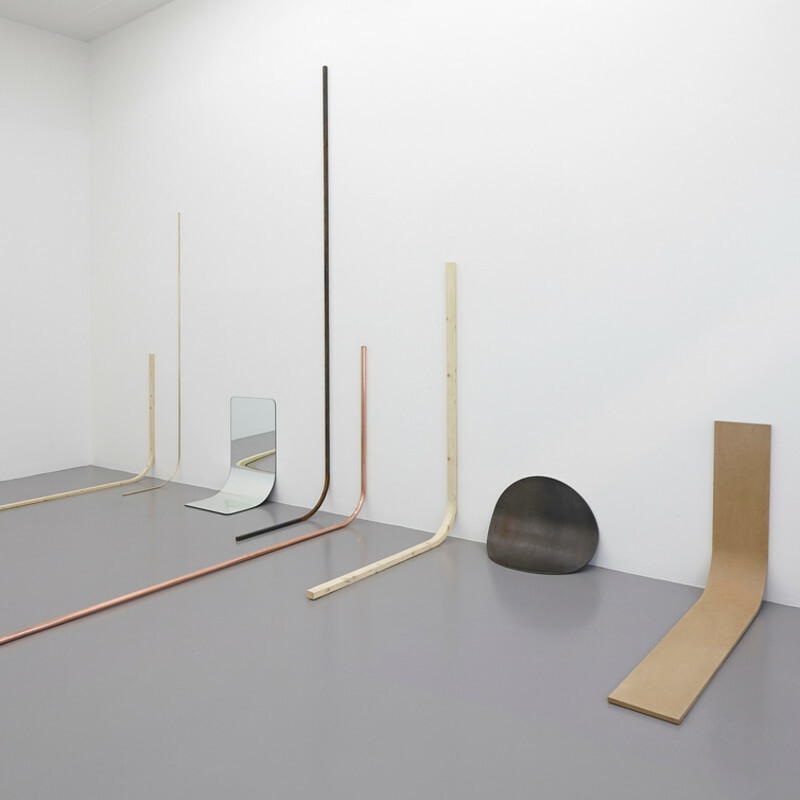 Alicja Kwade has received much recognition in recent years for her sculptures, installations, and videos. Oscillating between the familiar and the fictional, she combines ready-mades and skillful craftsmanship in sophisticated installations that provoke, amuse, and surprise. Her work possesses formal sculptural qualities with roots in minimalism bordering the surreal or the uncanny. Kwade is interested in scientific phenomena and musings, manipulating objects, processes, and concepts in ways that seek to challenge, if not defy, the laws of physics. She looks for simple ways to arrive at an understanding of reality in which established conveniences and materials are re-arranged and re-valued. Kwade questions cultural hierarchies and agreements by challenging objects’ functional identities and by scrutinising the inherent quality of materials and conditions. Her world is one in which nothing can be taken for granted. Stellar Day, 2013. A half-ton boulder sits on the gallery floor. At a first glance it looks like an ordinary stone, however, careful observation reveals that the stone is rotating – very slowly, in an anti clock-wise motion. Moving against the direction of the earth’s rotation, the stone completes one full turn in 23 hours, 56 minutes and 4,099 seconds, the equivalent of one day measured in “Sidereal time” (a time scale based on the Earth’s rate of rotation measured relative to the fixed stars). The boulder can thus be seen as the only ´still´ thing on Earth, given an almost extraterrestrial quality, located on Earth but not subject to the planet’s physical laws. Influence, 2013. Mounted on the wall is a 1930’s institutional wall clock with a nail next to it in on the lower left hand side. The clock´s second hand speeds up during a 15 second period of each minute when it passes the nail as if affected by it in a peculiar way. Despite this interruption each minute remains “correct”. Many of Kwade’s works deal with the phenomenon of time and clocks as entities hold an ongoing fascination for her as the ultimate fusion of the temporal and the physical. The Heavy Weight of Light, 2012. Lengths of various industrial materials – bronze, copper, and wood – together with sheets of mirror and stainless steel are subtly arranged side by side. Because the individual elements of the installation are bent ninety-degrees along the wall and floor, usual material properties are transformed; otherwise hard substances becoming soft or liquid and appearing to slide gracefully down the wall onto the floor. Kwade has done a special edition work for this show, Motion, 2013. Alicja Kwade was born in 1979 in Katowice, Poland and currently lives and works in Berlin. She studied at Universität der Bildenden Kunst, UdK, in Berlin. Solo exhibitions include: Kunstmuseen Krefeld, Haus Esters, Germany (2013); Skulpturenpark Köln, Cologne (2013); Kunsthal 44 Møen, Denmark (2012); ZKM Karlsruhe, Germany (2011); Oldenburger Kunstverein, Germany (2011); Kestner Gesellschaft, Hanover, Germany (2010); Westfälischer Kunstverein, Münster, Germany (2010); Group exhibitions include: Palazzo Strozzi Fondazione, Florence, Italy (2013); Museum of Contemporary Art Detroit (2013); Palais de Tokyo, Paris (2012); K21 Kunstsammlung Nordrhein-Westfalen, Düsseldorf, Germany (2012, 2010. Alicja Kwade received the Robert Jacobsen Prize in 2010 and the Piepenbrock Prize for Sculpture in 2008.